Toshiba has revealed a host of new ‘E-Generation’ laptops aimed at business users, all of which use Intel’s latest 8th-gen Core processors. There are seven new models in total which include the Portégé X20W-E and X30-E, Tecra X40-E, A50-E and Z50-E, along with the Satellite Pro A50-E and R50-E.
All of these use Intel’s 8th-gen CPUs, as mentioned, along with DDR4 system RAM (clocked at 2400MHz) and a 1TB SSD. The Portégé X30-E comes with a non-reflective 13.3-inch touchscreen, and it’s very trim at 15.9mm thick with a weight of 1.05kg. This notebook also has integrated LTE support for working on the move – as does the Portégé X20W-E and Tecra X-40-E. Indeed, the X20W-E (pictured here) is even slimmer at 15.4mm, although it weighs a tad more than the X30 at 1.1kg. 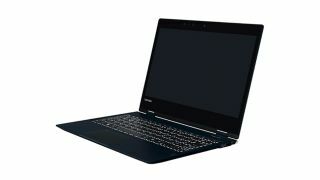 These are designed to be sleek and portable notebooks, and as business models, Toshiba claims they are robust, benefiting from a magnesium chassis that boasts a honeycomb design for ‘enhanced device strength’. The notebooks also sport security features including a SecurePad fingerprint reader and infrared camera for Windows Hello login. All of the machines have the fingerprint sensor except for the Satellite Pro R50-E, and the IR camera is on board the Portégé X20W-E and X30-E, as well as the Tecra X40-E. The Portégé X20W-E, X30-E and Tecra X40-E with LTE will go on sale in April, with all of the other laptops – including the versions of the aforementioned models without LTE – to hit the shelves in March. Pricing is still to be confirmed.